So-o-o Big! - Latest Fashions in Beams for 144 Mc. Not all amateur radio operators are inclined toward building and/or servicing electronic equipment, even though a basic level of circuit knowledge is required for earning a beginners' license (Technician level). A little additional circuit theory is added at the General level, and a lot more is required for the Amateur Extra exam. Still many prefer to have their only involvement with receivers and/or transmitters be turning dials and flipping switches. High voltages and easily damaged components inside the chassis add to the reluctance of some people to enter the realm. For those who do not want to simply purchase everything pre-built, there is an equally critical part of the setup that can be custom made: the antenna system. A degree of mechanical aptitude is needed to construct a durable multi-element antenna, especially one which operates at longer wavelengths (lower frequencies), since the physical dimensions can get very large. Since the antenna beam pattern is a function of what part of a wavelength it is mounted above the ground (usually the higher the better), the structural integrity of the tower can be a major challenge as well. The 144 mc. 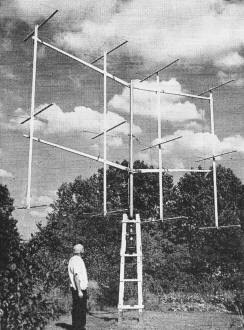 (MHz) antennas in this article have half-wave elements at around 40 inches, so that is no too extreme. 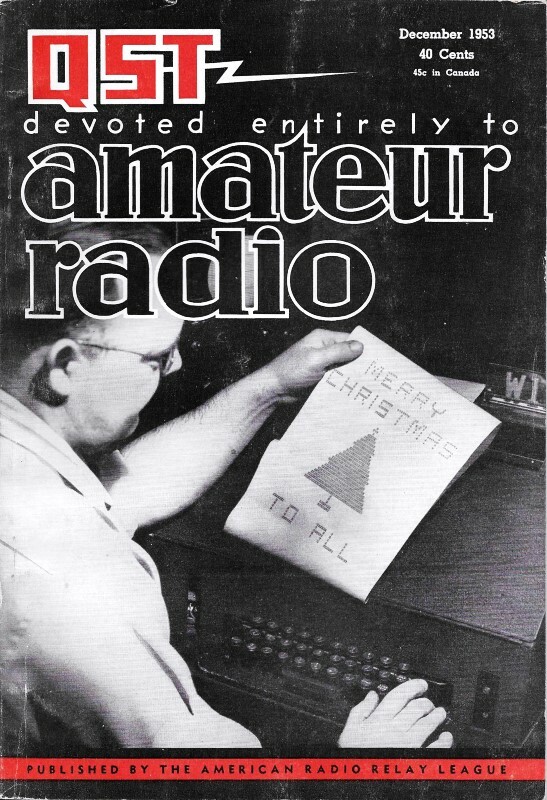 I notice that one Ham, Mr. Herbert Johnson's (W3QKI), in the article lives in Erie, Pennsylvania, which is my adopted home town. His call sign is no longer listed in the FCC's License Data Search records. W1CCH, Springfield, Massachusetts, admires his handiwork - a 60·element beam for 144 Mc. It's a well-known fact among v.h.f. men that it is the size of an antenna that counts. You can't get optimum performance by cramming a large number of elements into a small space. The capture area of the array determines its effectiveness, particularly in receiving, which is half the battle. With a given number of elements, the larger the frontal area, the better the array will work, assuming, of course, that the elements are phased properly, and the system will take power. Much of the progress on 144 Mc. in recent year's has come about because the antennas have been getting bigger and better. The fellow who worked with a folded dipole has gone to a 4- or 5-element beam. The former owner of a single parasitic army now has at least two of them stacked; usually with full-wave spacing. 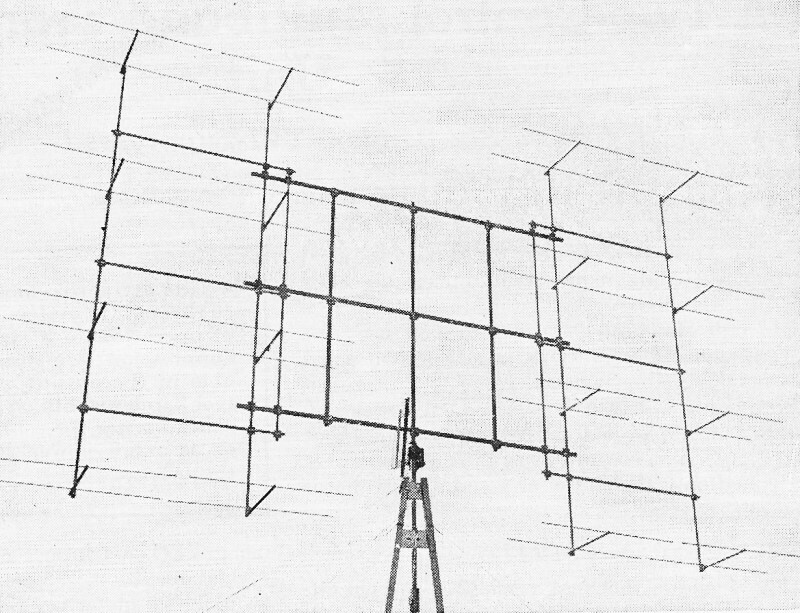 A 16-element collinear is no longer considered to be a "big" antenna, and 32-element arrays are by no means the largest in existence, as they once were. Configurations run to two general classes. One school builds its beams in sets of parasitic arrays; the other uses collinear elements, with either parasitic or screen reflectors. There is great difference of opinion as to the merits of the two approaches, but either one can do an outstanding job if the array is made big enough. In general, the collinear array is less critical as to frequency, but, the big parasitic structures appear to give somewhat more gain for a given frontal area, when they arc tuned up exactly on the nose. The collinears usually employ half-wave spacing; the parasitic arrays run to full-wave in both vertical and horizontal spacing of the component arrays. Examples of both styles are shown in the accompanying photos. 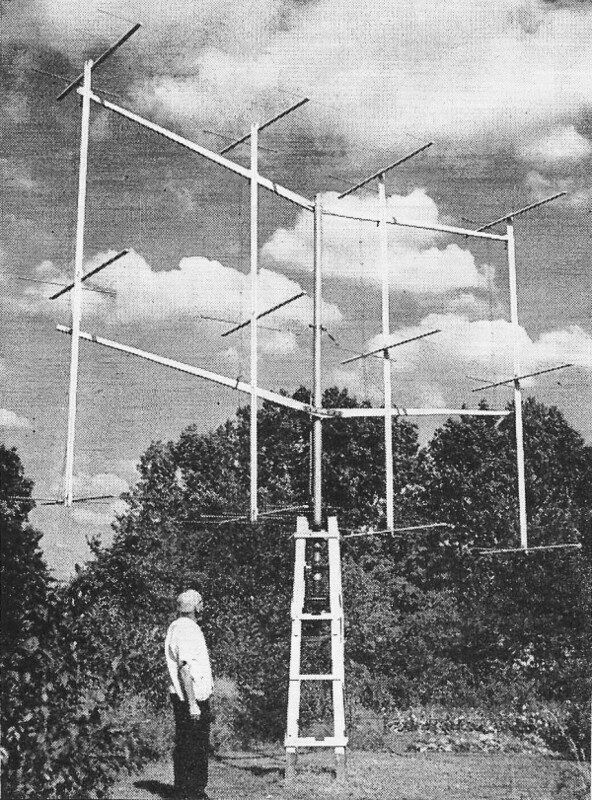 The monster at the lower left is probably the biggest 2-meter array ever built, a 104-element box-kite erected by W3QKI, Erie, Pa. Herb started out to check the worth of long Yagi configurations. There seemed to be almost no limit to the number of elements in line that would produce some additional gain. Ten elements showed considerable gain over 6 or 7, and 13 gave another decibel more than 10. How about a bunch of 13-element arrays? There was only one way to tell, and the 104-element array was that way. Made up of eight 16-foot booms, each carrying 13 elements, the W3QKI array is 27 feet long, 16 feet deep and 10 feet high. Its center is 43 feet above ground. Performance? Ask anyone who has worked W3QKI! Checks indicate a power gain of nearly 200, or in excess of 22 db. Aiming becomes a major problem with such a monstrosity, as the nulls in the pattern are only about 15 degrees apart. What such gain can mean in terms of 2-meter coverage can be judged by the signal Herb puts in at W1HDQ. In a series of daily skeds, W3QKI was worked every try - over a distance of about 375 miles. The other parasitic job is a midget by comparison, but still a mighty bit of antenna construction. It consists of two 30-element arrays that follow the W2NLY design,1 mounted side by side. It is the handiwork of W1CCH, Springfield, Mass. Two-meter operators in most of the Northeast know its signal well. A similar array is in use at W1NH, Bennington, Vt., and these two fellows work regularly on 144 Mc. over a path that would have been considered completely hopeless a few years ago. The third member of our Big Three is the 32-element array at W1VLH, West Hartford, Conn. It is composed of two 16-element arrays that follow the all-metal design shown in recent editions of the Handbook. The frame is so constructed that the spacing between the two arrays can be varied from zero to 5/8 wavelength. Mounted on a temporary support only 10 feet off the ground in a typical residential location, it has outperformed a smaller array that is 100 feet above ground. The 32-element job is now at 40-foot height, and after it has demonstrated its anticipated ability to withstand the hazards of a New England winter, it will be hoisted to the tower position, slightly more than 100 feet above ground. 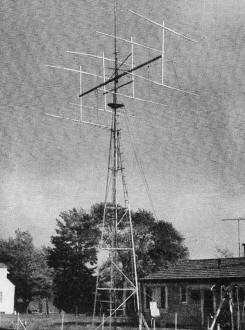 Already, even at the 10-foot level, it has provided the 100-watt rig at W1VLH a signal to be reckoned with in work with the W2s, 3s and 4s, at distances up to 400 miles and more. Some other unusual but effective arrays presently in use on 144 Mc. include a 48-element job at W2NLY, a 40-element set-up at W2UK, and a 28-element array at W2ORI. 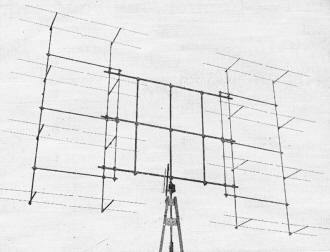 The latest in a long line of antenna efforts by W2NLY consists, in effect, of two 24-element arrays one above the other. This runs to considerable height, requiring a rotating structure more than 36 feet from top to bottom. W2UK's 40-element job also is a tall one, with eight 5-element arrays, 4 high and 2 wide, with full-wave spacing. The 28-element array used by W2ORI is made up of four 7-element Yagis, with full-wave spacing in both dimensions. Put the W2UK and W2ORI beams together and they spell communication. These two fellows work around the clock at any season, in any weather, though they are separated by some 280 miles. - E. P. T.
1 "More Gain with 30 Elements," Kmosko, CQ, Jan. 1950.